When I was a kid, I spent most hot, humid summer days cooling off at the community swimming pool. I got there by riding my bike and returned the same way. By the time I returned home, however, I was just as hot and sticky as when I had left hours before. We drank a lot of water in those days, sat in front of table fans and hoped for some sleep after the sun went down. Sometimes when the heat had totally worn me out, my mother would agree to let me sleep on the chaise longue out in the somewhat cooler, enclosed porch. It was always a delicious, scary event. More times than not, a storm would suddenly blow in and I would run, petrified, back into the house as lightning and thunder crashed around me. The next morning, my mother would tell me that we had needed a good rain and that is why she let me sleep out in the porch. I always wondered if my timing was just a coincidence. By the time my own children were old enough to enjoy their community pool, things had changed; I was driving them from an air-conditioned home, in an air-conditioned van to the pool. I was sitting by the side of the youth-pool watching them play and I was being driven crazy with the boredom of it. My mother would never have done this! One day, after a few sessions of this summertime torture, I decided that on the next trip to the pool I would bring along a bagful of cookbooks checked out from the local library. At least I could amuse myself as I did my mother-duty and just maybe, I would even discover the next best recipe. "So many recipes...so few good ones," I often thought as I considered each one and rejected most. I did earmark a few pages, and actually tried out several concoctions, but for the most part, nothing of lasting value came from my search. However, I did keep my poolside sanity! To be fair, a recipe for a clever Easter salad did come from this exercise and I will share it soon. It has been passed along to family and friends all over the country...everyone is crazy about it. Sometimes, however, we find a great recipe when we are not even trying. Today's recipe is one of those. It is such a wonderful tasting dish that, my husband talked about it for hours afterward. Luck was with me the day I rummaged around and found ingredients that seemed to just fall together in a happy blend of flavors. Artichoke Chicken Festiva is a new favorite dish and I hope you will try it out. Heat a large, heavy pan on med-high heat. Add olive oil to coat the bottom of the pan. When oil is hot, place chicken breasts in pan and brown both sides. Sprinkle chicken with your favorite pepper blend while browning it. Lower heat to medium. Remove one breast at a time and place on cutting board. Make diagonal slices approximately ½ inch thick. Place chicken slices back in the pan and cut the second breast as the first. Next, gently stir in mushrooms and cook over med heat until chicken loses all of its pink color, stirring occasionally. Turn down heat to low and add marinated artichoke hearts, Italian sauce, the black olives and the macaroni. Mix well and heat through. To serve, place chicken mixture on serving plate, place a large spoonful of buttered broccoli pieces on top and sprinkle a handful of shredded sharp cheddar over broccoli. 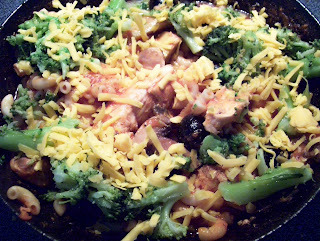 I originally served the broccoli with cheddar as a side dish, but it tasted so wonderful mixed in with the chicken and sauce, I decided to make it part of the recipe. *Cooking chicken breast from the frozen stage keeps it moist and tender. **I often cook an entire box of elbow macaroni and keep it bagged in the refrigerator. Pasta is great for impromptu additions to many recipes. Carol wrote: This is priceless, you put into words that only you can. I am looking forward to you wonderful recipes, and thrilled that you are sharing them with us.